A diverse team at CSI works on the LittleFe project. The LittleFe project is surely a misnomer as the efforts spent on building this mega-computer are anything but little. 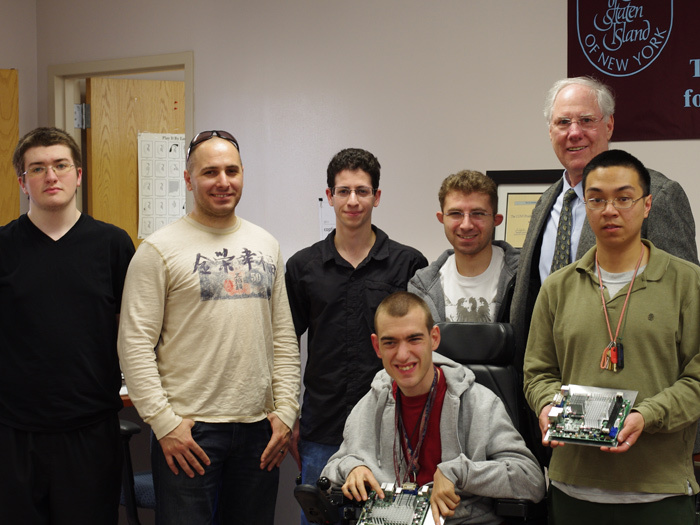 The initiative, which is lead by Vice President of Technology Systems Dr. Michael Kress along with professional staff from the Division of Student Affairs, involves seven young adults at CSI who are actually building a parallel processing computer. These diverse individuals meet in the Center for Student Accessibility’s Multimedia Resource Center at CSI every weekend and work together seamlessly on a collaborative project that will result in the grouping of six computers to form one that will perform with much better speed and efficiency than other traditional systems. “LittleFe provides an opportunity for this CSI team to learn key concepts of parallel and distributed computing such as speed up, efficiency, and load balancing, which are more effectively done on a parallel platform,” explained Dr. Kress. The LittleFe team members are CSI students Michael Costantino, Daniel Kurzweil, Jonathan Parziale, Christopher Savo, and Brian Wong; McKee Technical High School student Alaric Hyland; and CSI College Assistant Timothy Smolka. Center for Student Accessibility staff members Nicole Dory and Maryellen Smolka supervise the group. “This project is as much about the team as it is about the supercomputer and autonomous robot it is building. The team is comprised of some of CSI’s best students, technical staff, and an exceptionally talented high school student,” said dr. Kress, adding that the diverse group members include students with and without disabilities. LittleFe weighs less than 50 pounds and can be set up in about ten minutes, making it possible to have a powerful ready-to-run computational science and HPC educational platform for less than $3,000. Future utilization of LittleFe at CSI has not been completely determined yet, although the CSI supercomputer will be featured at the Supercomputing Conference in Salt Lake City, UT this November. This International Conference for High-Performance Computing, Networking, Storage, and Analysis will feature the “best and brightest minds in supercomputing” with unparalleled technical papers, tutorials, posters, and speakers. Little Fe was also a major attraction at this year’s Undergraduate Research Conference, and team members were filmed for NY1.